The “Little Sunfish,” the swimming robot that TEPCO is using to capture images of the containment vessel in the Unit 3 reactor of the ruined Fukushima power plant, has brought back the goods. A trove of new images captured in the past few days show what is likely to be melted nuclear fuel from inside the reactor, what Bloomberg describes as a “potential milestone” in the cleanup of one of the worst atomic disasters in history. The pictures show what looks to be the melted nuclear fuel that caused the worst-ever nuclear disaster when northeastern Japan was hit by a massive earthquake and tsunami in March 2011. If confirmed, these would be the first discovery of the fuel, which is being sought by TEPCO as part of the cleanup effort. “Tokyo Electric Power Co. Holdings Inc., Japan’s biggest utility, released images on Saturday of mounds of black rock and sand-like substances at the bottom of the No. 3 reactor containment vessel at Fukushima, which is likely to contain melted fuel, according to Takahiro Kimoto, an official at the company. A survey on Friday found black icicles hanging from the above pressure vessel, which was “highly likely” to contain melted fuel. Kimoto noted it would take time to confirm whether this debris contains melted fuel. The pictures were taken by the “Little Sunfish,” the Toshiba-designed robot the company sent into the destroyed reactors to explore the inside of the reactor for the first time from July 19. 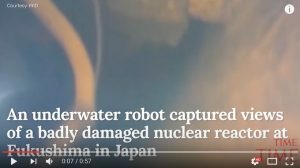 The robot, 30 centimeters (12 inches) long that can swim in the flooded unit, was tasked with surveying the damage inside and also finding the location of corium, which is a mixture of the atomic fuel rods and other structural materials that form after a meltdown. “It is important to know the exact locations and the physical, chemical, radiological forms of the corium to develop the necessary engineering defueling plans for the safe removal of the radioactive materials,” said Lake Barrett, a former official at the U.S. Nuclear Regulatory Commission who was involved with the cleanup at the Three Mile Island nuclear power plant in the U.S.
Until now, TEPCO hasn’t managed to find the melted fuel, presenting a major obstacle in the cleanup effort, where the removal of the fuel is considered one of the most difficult steps. Sightings of what was believed to be the destroyed fuel in reactors No. 1 and No.2 proved to be inaccurate. “Similar to the latest findings in the No. 3 reactor, Tepco took photographs in January of what appeared to be black residue covering a grate under the Fukushima Dai-Ichi No. 2 reactor, which was speculated to have been melted fuel. However, a follow-up survey by another Toshiba-designed robot in February failed to confirm the location of any melted fuel in the reactor after it got stuck in debris. According to Bloomberg, because of the high radioactivity levels inside the reactor, only specially designed robots can probe the unit. And the unprecedented nature of the Fukushima disaster means that the utility is pinning its efforts on technology not yet invented to get the melted fuel out of the reactors. The budget for the cleanup, which is still running behind schedule, has more than doubled to a whopping $188 billion last year. TEPCO has also not been able to decide on what to do with the 777,000 tons of water contaminated with tritium when it was used to cool down the plant’s cores, and has petitioned Japan’s government to allow it to dump some of the water into the Pacific. According to the officials, tritium is not harmful in small doses. It’s believed that the decommissioning of the reactors will cost 8 trillion yen ($72 billion), according to an estimate in December from the Ministry of Economy, Trade and Industry, and take as long as 40 years.